There were two options for the trunk lid from Chrysler. The Flite-Sweep which had a faux spare tire stamped in the trunk lid, and then the standard lid. All Ghias to my knowledge came with the standard lid. I think the Italians found the Flite-Sweep ghastly. I own a Ghia or two that have a Flite-Sweep on them and the evidence shows that it was added after it came to America. Besides, when you add the Flite-Sweep you have to dump the Ghia only bird and crown that you see in this picture. The bird and the crown are all heavy cast brass. The backing plate is thick sheet brass, hand formed, and then gold plated. The Imperial emblem is simply a front bird lens that’s been whittled down and applied to the back bird. The rear bumper was treated to a Ghia manufactured grill. The stock ‘57 rear bumper had a ribbed plate next to the backup lamp. Ghia hammered and rolled a dish approximating the look of the backup lamp’s bezel. They then filled it with individual rectangles that appear to be made on a milling machine. The whole thing was chrome plated and matches the design of the Chrysler built front grill, completing the Ghia conversion. Pictured is one of our reproductions. This photograph shows one of the more sublime modifications to Ghia specifications. The stock fin has been enhanced by eliminating the stock horizontal chrome spears and by adding steel and lead fairings that approximate the height and length of the spears. The holes you see accommodate a handmade thin chrome strip. A much more elegant execution of the original design theme. Also notice the handmade reflector base beneath the tail light opening which will be capped by a stock reflector. The finished product is like the rest of the car, a casual glance will make you think it’s stock, but it’s far from it. This pictures shows the assembled horizontal spears and back cut halos that have been inserted with body colored plates. The original halos were Ghia pieces that were custom cast with the inset painted, however they were extremely porous and almost evaporated over time. The difference between these back-cut originals and the Ghia pieces is that on the rear most edge there should be a small right angle cut in the trailing edge. The ones that I devised are much more rugged and the powder coated inserts should last forever. Also of note is the rear most ring on the tail light lens, these were spun brass with three attaching pins soldered on. The tail light lens was hand cut with what appears to be a pocket knife or razor blade, to create a flat spot and then the flat spot is drilled to accommodate the pins which are folded inside the lens. Note the right-angle cut on the trailing edge of this original factory halo. The front door was the closest to being stock. It used a stock window, vent and pivot, and most of the interior door mechanisms were stock. The limo roof cut-in that was added to the door required internal reinforcement and some modification of the glass runs. The left front door panel has many Ghia features. First and foremost is its leather covering, the trim moldings and cubbyhole are stock. 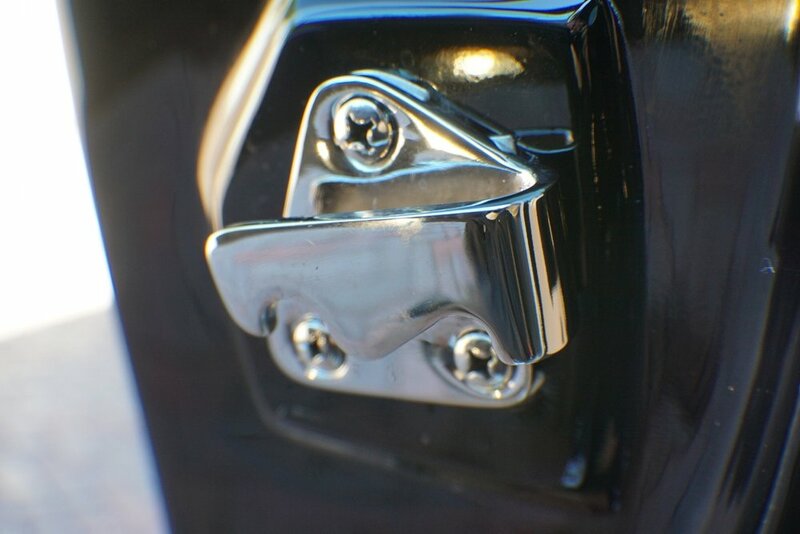 The door handle that you see is covered with scythed black leather and the piece of chrome that is facing you is handmade with threaded studs. The window switches, which appear stock, are not. Unique to Ghia, the two front window switches run power directly through the switch as is stock. The two rear window switches are wired to ground and fire relays mounted under the front seat to run the two rear windows up. The front window switch was modified by taking a hacksaw and splitting the buss bar on the back of the switch (a buss bar is a common bar that supplies power to many loads). The rear window side of the switch had a wire soldered to it and mounted to the inner door frame. This allowed half the switch to supply power and the other half to provide ground. In true limo fashion they are wired so that from the front, the rear compartment windows can only be raised and not lowered. All Ghias had the factory door striker chromed. Since they were modified by Ghia, they were production numbered. The door jam (on the inside of the door) and the door pillar (on the car) have all of the spot welds and seams that are normally seen on a production automobile, leaded over and finished like the outside of the car. The original manufacturer’s logo was ground off the striker before chroming. 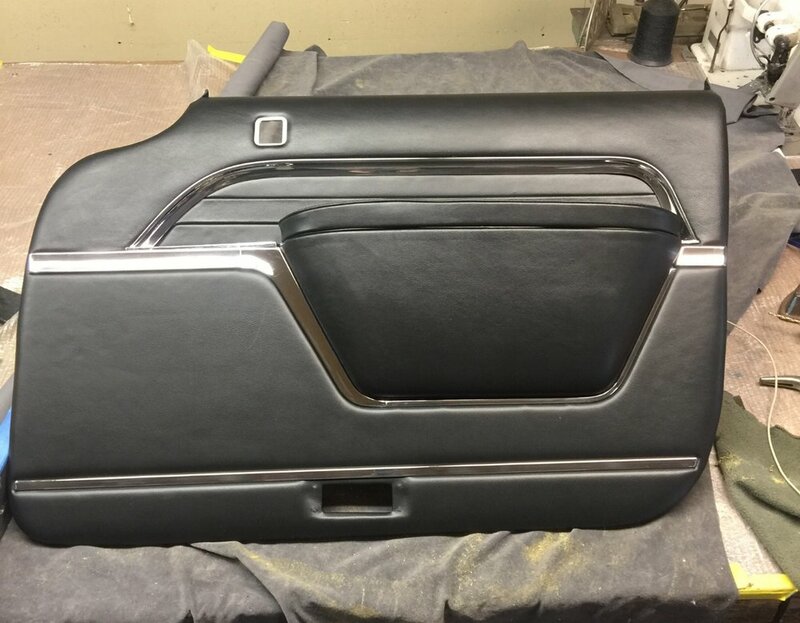 The front door trim panels were fiberboard original Chrysler made units disassembled by Ghia and covered completely in leather. They were slightly modified at the top to accommodate the window frame. They probably started life as sedan trim panels (with post between front and rear door) and were shipped with the original body which was a two door hardtop with no doors on it. In the restoration we chose to eliminate all the original fiberboard parts and remake them in aluminum. The indention you see above the arm rest was hand formed with a hammer and dolly. Originally this was all just press fiberboard. The arm rest/cubby hole was originally a high density foam that had broken down. We had to make our own molds and pour or own foam for replacement. Over the years I have had many Ghia parts reproduced including side glass sets, fender eyebrows, rocker panel moldings, divider glasses, divider sheet metal, divider regulator arms, rear birds, crowns and backing plates, and complete bumper garnish sets.